I saw The Portal on December 3 – its opening night – at the Minetta Lane Theatre. 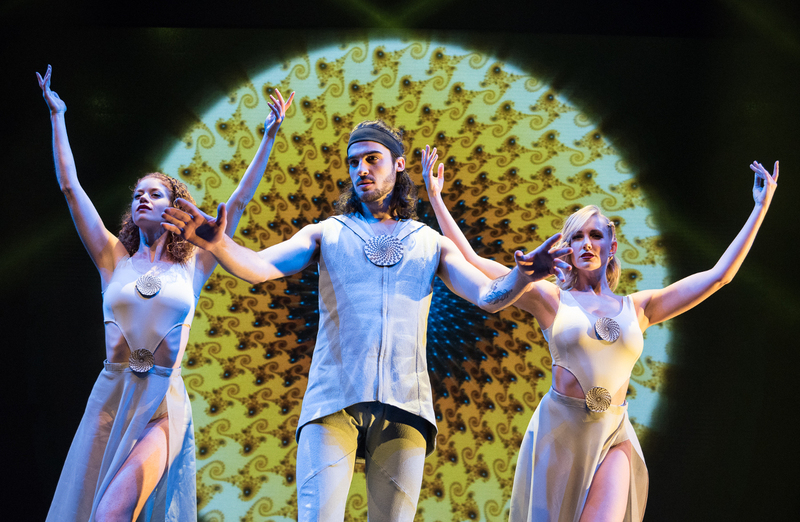 Part-concert, part-movie, and part-interpretive dance, this is not a typical night out at the theatre. The Portal combines live performers and video projection to tell the story of Dante, a man dissatisfied with his modern upper-class life. He sips drinks and complains about not connecting women, until he goes on a journey of self-discovery. Trading his button-down and sensible slacks for a Jesus robe and walking stick, Dante walks through the wilderness and meets three figures that embody Power, Identity, and Death/Transformation. In the video, Power is a man in black with a chip in the middle of his forehead, and on-stage, he appears as a businessman, carrying a luminescent smart phone. Identity is a man with a TV for a head, and the TV is constantly playing Fox News. The character’s design is very similar to Prince Robot IV from the comic series Saga, and if Dante isn’t on his guard, the TV can hypnotize Dante into a dazed stupor. The last figure of Death/Transformation wears a dark cloak, carries a sword, and generally appears ominous. I’ve struggled to explain my feelings about The Portal. This might not sound particularly promising for the show, but hear me out. I got a huge kick out of The Portal. I was thoroughly entertained. My dilemma is that I wasn’t entertained for the reasons that the creators intended. Here is what works in The Portal. The music is the heart of this show, particularly star and vocalist Billy Lewis Jr. and guitarist Paul Casanova. Smartly, the show has made the entire album available for streaming online here. The Portal works the best when it takes a break from the filmed segments and sticks to the music, dancing, and psychedelic imagery. 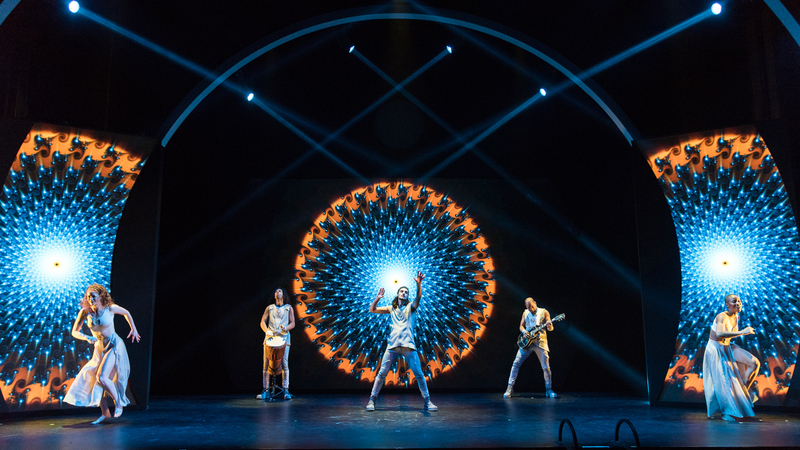 In those moments, the show lives up to its mission statement of being an “allegorical and dreamy” stage journey of self-discovery, and I can enjoy it as a psychedelic concert in line with something like Hair or Tommy. The problem is that the show is interspersed with all of these filmed segments that remind me of Mystery Science Theater 3000’s greatest hits. This is where my unintentional enjoyment of The Portal comes in. These segments are simultaneously sincere and also ridiculous. The representations of Power, Identity, and Death/Transformation are clichéd and obvious, giving the filmed sequences a student film quality. Dante’s spiritual journey also feels shallow, and the creators mash up so many different spiritual influences together that the end produce doesn’t add up to much. It reminded me more of the cult classic The Apple or The Touch of Satan, or for a more recent reference, Will Smith’s disastrous Collateral Beauty, which also features three actors representing concepts (Power/Identity/Death vs. Death/Time/Love). If The Portal had left out the filmed sequences, I would have recommended it to theatregoers who prefer experimental work, psychedelic art work, and rock music. As it is, The Portal is best appreciated with a couple of tall drinks (or as How I Met Your Mother put it, eating a big ol’ sandwich), a good sense of humor, and an appreciation for camp. The Portal is currently running at the Minetta Lane Theatre, located at 18 Minetta Lane. Tickets start at $49 and are available for purchase in advance online here or by phone at 1-800-745-3000. Additionally, there are a limited number of $25 tickets for students, available two hours before curtain.